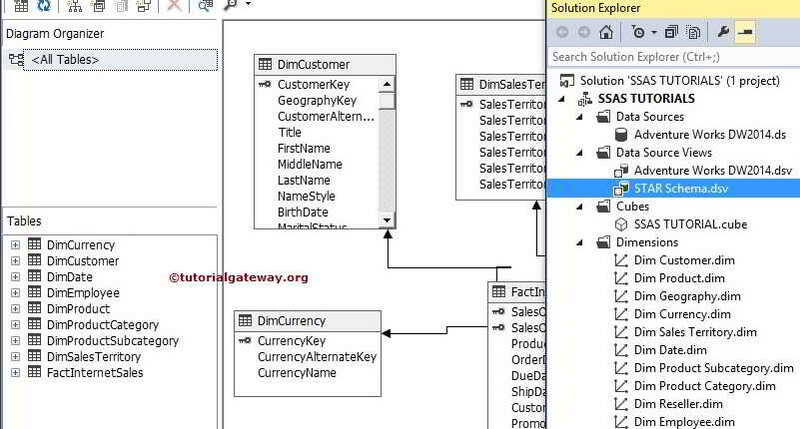 All the dimensions that are created using the Dimension Wizard of the Solution Explorer are treated as database dimensions. In other words, the dimensions which are at Database level are called Database Dimensions. From the above figure, all the dimensions such as Dim Customer, Dim Product etc.., which are placed under the Dimensions folder are Database Dimensions. A cube dimension is an instance of a database dimension within a cube. Cube dimension are accessible inside that particular cube, We can’t access cube dimension in another cube. Please refer Create Cube Dimension in SSAS article to understand, How to create Cube Dimensions in SQL Server Analysis Services. From the above screenshot we have to understand that, All the Dimensions present in the Dimensions Pane are called as Cube Dimensions and all the Dimensions present in the solution explorer are called as Database Dimensions. Database dimensions are created once and we can use them in multiple cubes. Cube dimensions can be created more than ones (we called it them as Role Playing Dimensions).